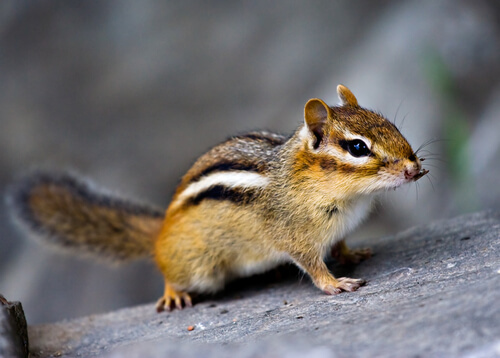 Hogarth’s Wildlife and Animal Removal specializes in Eastern Chipmunk removal. The Eastern Chipmunk has reddish-brown fur on its dorsal side and white fur on its underbelly. It has two white stripes outlined in black running along its sides and one black stripe running center of its back. The Eastern Chipmunks pouched cheeks are used to store and carry food. Unlike other species of squirrels, chipmunks tend to stay on the ground and do not use trees or wires for access into the home. They prefer to find and exploit an open gap at the base of the structure or chew in through the garage door seal. Once inside they will begin to rummage through things, looking for bird seed or food storage in the garage. They also chew on wires in the garage or on a car. Chipmunks are typically not hard to control, unlike Red, Grey, and Flying Squirrels. 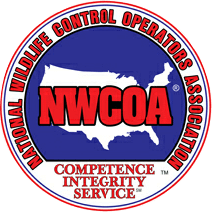 The best method for eradication is by trapping, removing, and maintaining by a licensed wildlife professional. The garage door seal and weather stripping are the two main areas that should be sealed and replaced in the home. Keep all birdseed in metal, lidded containers. Do not leave garages doors open unless in use. Food related items should be in closed shelves or pantries.